Here is Below are Box office collection report of Bollywood Movie 'Jolly LLB 2' With his Budget, Profit and Hit or Flop status. Also including of the movie lead star cast Akshay Kumar, Huma Qureshi, Annu Kapoor, Saurabh Shukla. 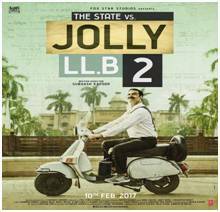 Jolly LLB 2 is an Indian black comedy drama film of 2017, directed by Subhash Kapoor and produced by Fox Star Studios. Movie Review: Akshay credible performance, tapped with the positive reviews, helped in pulling audience in theatres. His earlier hists Airlift Houysefull 3 & Rustom also had great opening. Starring Huma Qureshi as Akshay's leading lady & Annu Kapoor as the antagonist, 'Jolly LLB 2' is the sequel of 2013 hit movie 'Jolly LLB' which had Arshad Warsi in the title role. A satire on the Indian legal system, the movie is making the news for Akshay's comic timing, music, strong dialogues and intriguing storyline. Akshay Kumar is a great actor nice movie awesome !!! Nice movie,its too much fun watching.